It's a bit odd to start out talking about this book, since it's not really a typical pick for me, but I just finished it and I want to get down why I disliked it. I have been on a young adult kick recently because it's often easier to get through them quickly (this doesn't mean there isn't a ton of quality there, as with any other so-called genre) and school has been insanely mind-consuming. I got through The Princess Diaries by Meg Cabot in one day; I haven't been able to get past Chapter 3 of Ulysses yet in the past four months. Anyway, I've seen Libba Bray mentioned in the Acknowledgments section of quite a few books I enjoyed, so my interest was piqued. I'm a save-the-best-for-last person, so I typically like to got through an author's work beginning with the less famous and ending with the most famous book(s). Donc, I read Going Bovine first. I wasn't enthused by it, but the writing was good, and I thought I might like the story of Bray's first series better. Now, here I am. 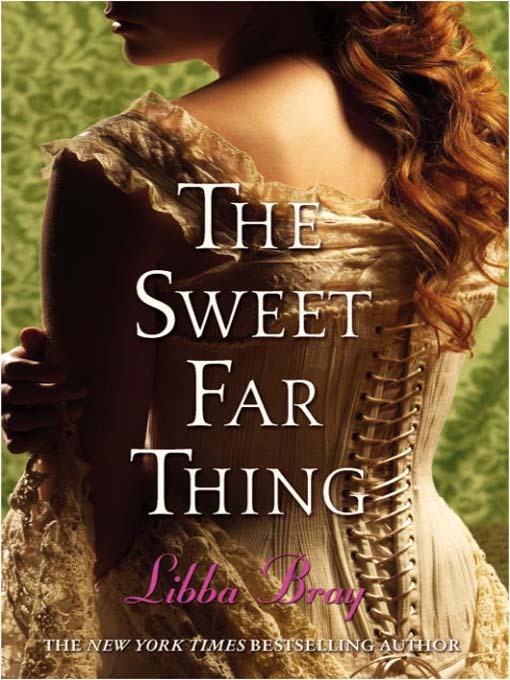 The Sweet Far Thing is the third and final book in what is called the Gemma Doyle Trilogy (this also includes A Great and Terrible Beauty and Rebel Angels). I really had no idea what this series was about when I started it other than it had some kind of supernatural element in it, which I am fine with if it's done well - as with anything else. This is the beginning of Amazon's description of the first book: "A Victorian boarding school story, a Gothic mansion mystery, a gossipy romp about a clique of girlfriends, and a dark other-worldly fantasy--jumble them all together and you have this complciated and unusual first novel." That sounds kind of awesome to me. I love the Victorian-era! And let's face it, almost every story could be improved if it were set at a boarding school! A Gothic mansion mystery? Hello, Jane Eyre is one of my all-time faves! Gossipy romps with cliquey girls? Yes, that was my high school life! Okay, minor spoiler alert: I've concluded that maybe I'm just not cut out for the fairy genre. I'd be interested in trying it out again, so I can decide if it's the genre or the story. This story just didn't hold together for me. The writing was good. Honestly, sometimes I had to pause for a minute to admire Bray. For instance, here: "They gossip over their needlework, small stitches to match their small talk" (718). Very nice, right? But to me - even in a supernatural world - for a story to be successful it must have some internal logic that holds up to scrutiny, that can be followed, that - within itself - makes sense. To me, these books did not have that. Could I explain the plots of these books to people? Yes. Could I justify why things happened the way they did other than that they were written that way? Often, no. In contrast, many smaller details were left unexplained in the Harry Potter series, but overall the world made sense and I understood it enough to extrapolate my own explanations for things that remained less than opaque at the end of the series. I found that with Bray's books, I was just reading to see what happened, but I was unable to form any expectations because the world didn't make sense to me. In addition, I found it hard to like or sympathize in the long run with the characters. When Forever Young Adult reviews a book, they ask "bff charm?" I don't think I would give a BFF charm to any of these characters. Ever. At any one time in the books. Maybe Kartik. Really, very little happens in the books. Gemma doesn't know what to do and plays irresponsibly and wonderfully with her powers for most of the book. Her friends are selfish but still her friends (this, I think is actually realistic for many girls this age, and I admired that it was portrayed as simply a part of their friendship). Others doubt Gemma, and she doubts herself. She investigates, but often half-heartedly, and is often a bit oblivious. Then some action happens (very quickly). Then...the ending. I must just say, what? Kartik?! And throughout it all, whenever something actually resolves or moves forward, I'm left going, "o-kay," rather than "cool, that makes sense." So I'm conflicted. I really didn't enjoy these books, despite Bray's writing skills. I was 80% through The Sweet Far Thing and then procrastinated finishing it for a few days - not because I was delaying the sorrow of finishing it, but because I really wasn't that interested in the ending. However, I have a sick need for finishing things (see, why I read all three of these books. Also, duh, Ulysses.) so I came back to it and got it done. Bray is a talented writer, which explains why I've now read all four of her novels even though I didn't really enjoy any of them. But, I have so far not been able to fully engage with her stories. I will be interested to see what she does next. Postnote: P.S. I did not like what she did next (Beauty Queens) any better, unfortunately. I won't give up! I will eventually read one of her books and find it completely enjoyable!